Take action: Tell your U.S. representative to support LGBTQ Illinoisans. Click the link to send a message. 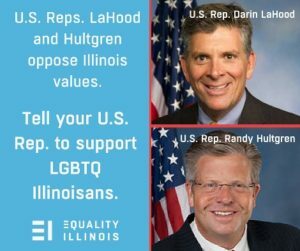 U.S. Reps. Darin LaHood and Randy Hultgren of Illinois are urging President Trump to sign an executive order that would allow discrimination against LGBTQ people. The proposed executive order is contrary to our laws and values in Illinois. Our members of Congress should support and spread Illinois values of fairness, justice, and the freedom to live one’s life without discrimination. Send a message to your member of Congress that you oppose this kind of executive order.